Hi Guys! Yesterday evening and this morning, I noticed when I pressed the brake pedal, the car would slow and stop as normal, but the brake pedal would not release immediately, but took about 5 – 10 secs to completely release. A couple of times I felt when I was starting off again, that the brakes hadn’t released completely and that I was driving with the brakes still on for a short distance. Any idea what the problem could be? Is it a trip to the mechanic, or something I could tackle myself? Thanks, :renntech: Colm. The year might help and if you have changed the fluid at all. I would suspect a sticking caliper and time for a rebuild. It's a 98MY Boxster 2.5. I bought the car last November with 46,000 miles on the clock. The service record says that the brake fluid was changed before at 45,000 miles, although I'm now doubting that. I understand that the brake fluid is to be done every 2 years, regardless of mileage. I now have 62,000 miles on the car, after 9 months, and I am due to carrying out the Major Service (60k Service) shortly, so maybe I should include a brake fluid change also. 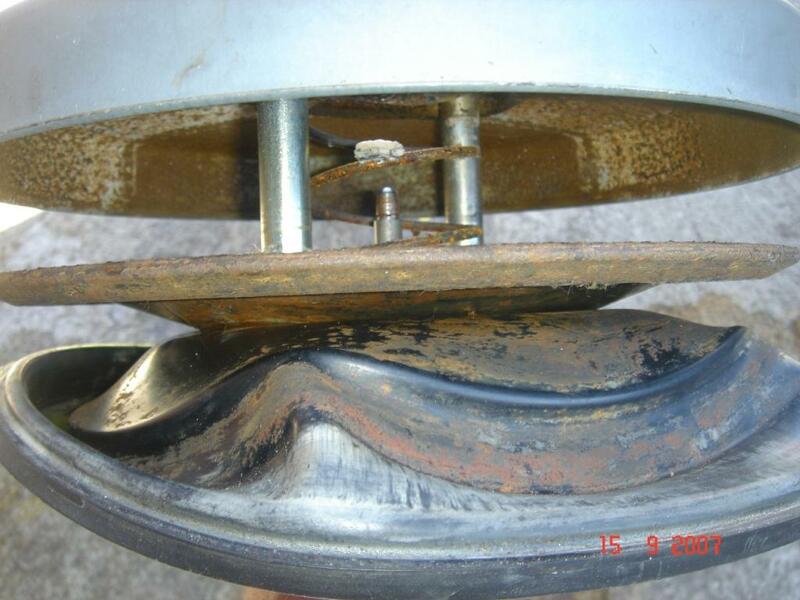 There have been reports of water migration into the brake booster causing the brakes to stay engaged. Plus severely neglected fluid with water an give the caliper pistons a short and sticky life. If you are due for a major service then do the brake fluid so you know where you stand, then a brake job. While there you or a tech can check out the calipers. I just spoke with my local Porsche Centre, and they told me that there were no recall issues with my car, but that the early model Boxsters ('97-'99) did have some problems with water getting into the Brakes Servo, and thus is causing brake pedal not to release immediately. He said that, obviously, he would not be able to diagnose the problem without seeing the car, but that if it was the servo, that he would also want to change the Master Cylinder too! I can just see the € Euro ($ Dollars) Symbols now! It never rains, but it pours, especially in Ireland! and it says "You can't open the booster, all you can do is remove the booster pour out and let him dry. This gives you no guaranty for the future replace is the best option. Brakes are a safety item, two hands are not enough, if you got no experience with brake systems go to a workshop." I have mechanical knowledge, including brakes, but not with Brake Systems. Is it easy to remove the booster to dry it out? So the question is, do I tackle the job myself, and just try and dry out the Brake Booster, only expense is the cost of new brake fluid, and a pressure bleeder... I think that's what they're called. Ok, I finally got around to tackling my Brake Booster problem. I decided to remove the booster to see if there was water in it, and also to see if I could drain it. This was going to be my second time working on the car. (First was the successful replacement of a window regulator). 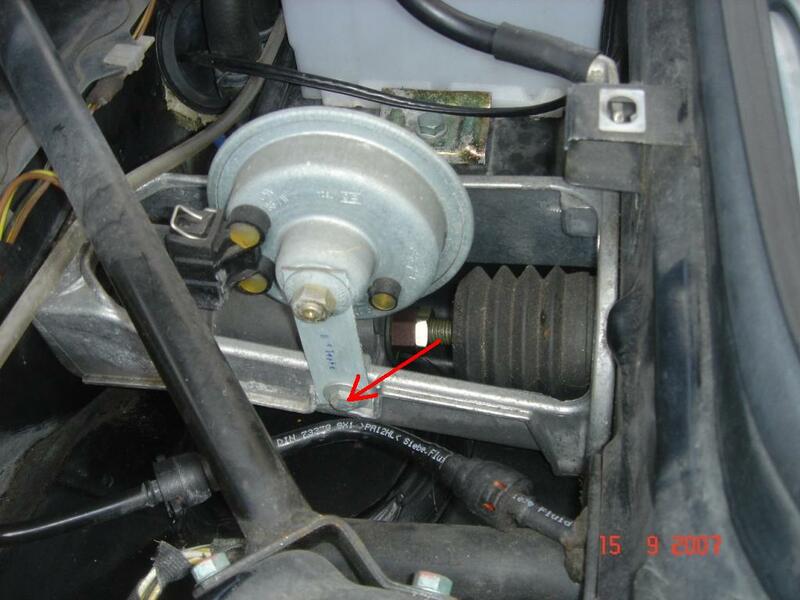 I was advised that the Brake Booster could be removed and re-installed without having to drain brake fluid, or disconnect the Brake Master Cylinder lines. So here goes, here's my first detailed post. Cleared the front trunk, removed the plastic trim and carpet surrounding the booster. Remove the two long pan head screws (red arrows). Remove the screw holding the alarm sounder, to gain more access. Loosen the lock nut (red arrow) and then loosen the connecting piece (blue arrow). Continue to loosen the connecting piece until they separate. Whilst loosening this piece, keep an eye on the bracket which holds the brake lines and vacuum line in place. As the booster begins to loosen away from the fire wall, you will need to pull these lines out of the brackets. 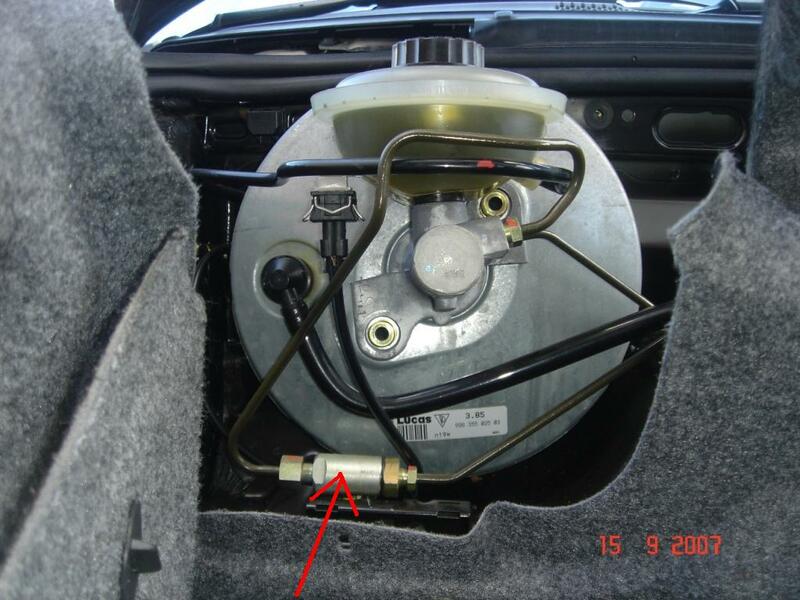 Remove the electrical connection (red circle) from the brake fluid container, as this gets in the way later on. 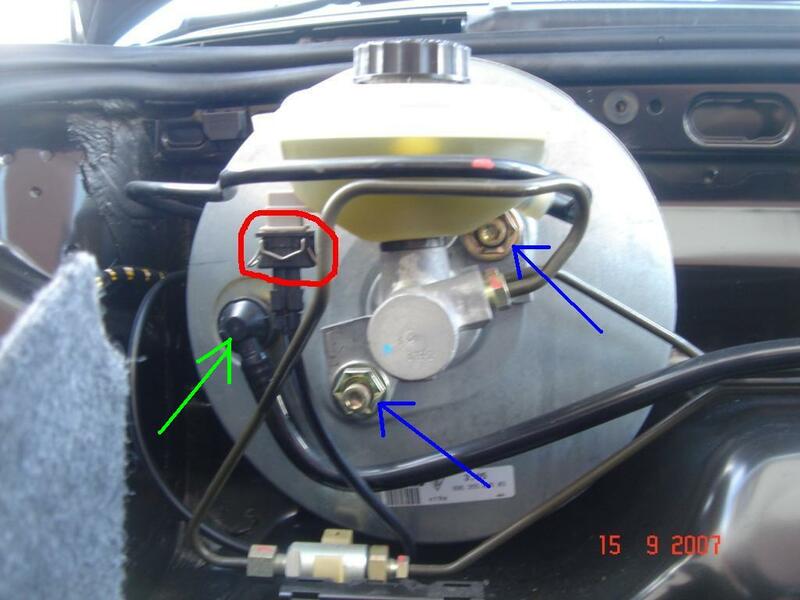 Remove the two hexagon nuts (blue arrows) holding the brake master cylinder to the booster. You may want to temporarily replace the two long pan head screws, to anchor the booster whilst loosening the two hexagon nuts. 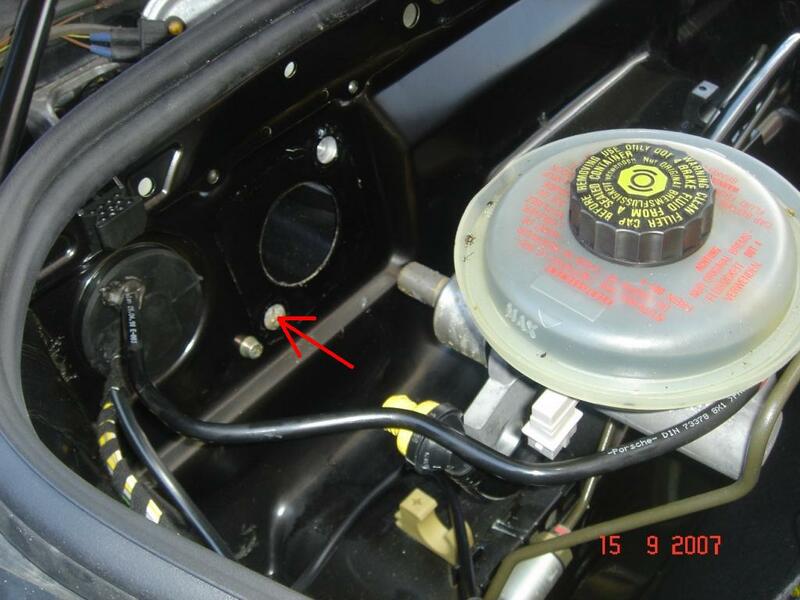 Remove the vacuum line connect (green arrow), this just needs a little effort. The cylinder, whilst still connecting to all of its lines, and the booster can be gently pulled out, and the booster lifted out. The booster was full of water. I noticed that it is this hole where the water gets into the booster from. The booster seals were leaking under pressure. It's difficult to drain the water completely from the booster, as there's a diaphram system inside, except through the vacuum connection hole. When I would operate the booster manually, I could see that over time that the seals had worn and were not operating 100%. With all of the visible water, gone, I could still hear water in the opposite side of the booster, so I decided to open the booster. This was done by just prying the clips up, all around the booster. 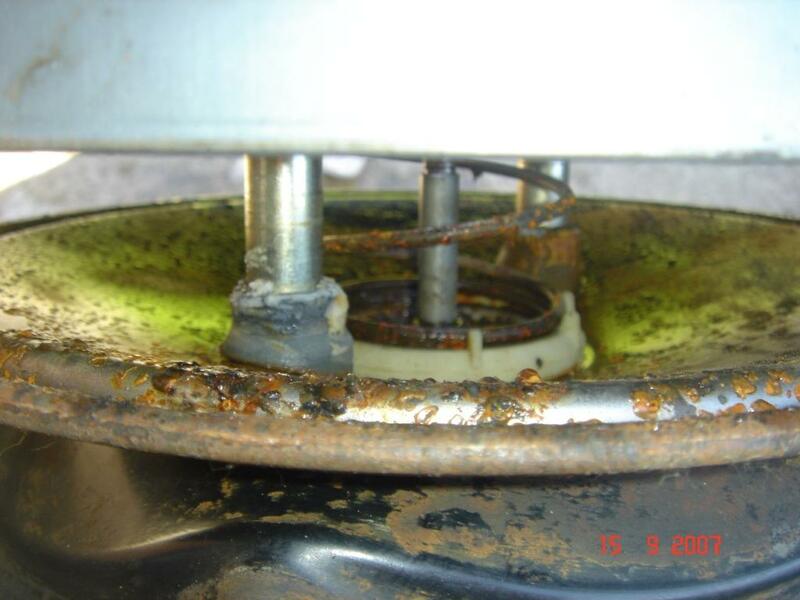 You can see that the booster must have had water in it for quite a long time, as there is alot of rust inside. I cleaned as much of it as I could, with engine cleaner. I completely dried out the booster, and put it back together again. 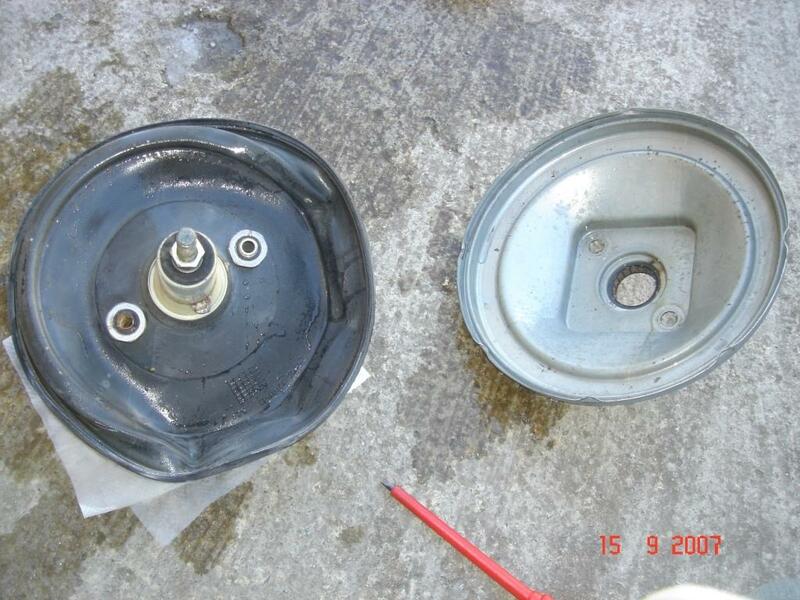 Here's a couple of photos of the inside of the Brake Booster! Glad to know this is a DIY sort of thing..... thanks for reporting back. Porsche changed the booster and/or bellows and seal at the fire wall for cars made after September 1999, which would be model year 2000. 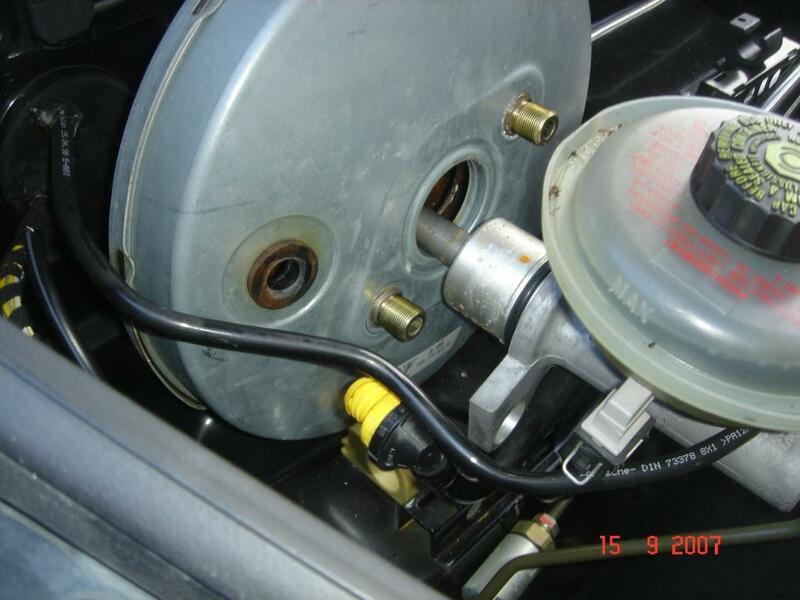 In 2002 Porsche issued 2 TSBs that describe what must be changed on the car if you replace the booster with the new style. They also say that the firewall was changed. 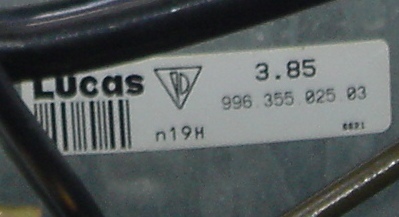 These TSBs are for cars made prior to September 1999, which would include your 1998. For example and since I have a 1997, if I want to put in the new style booster in my 1997 there are parts I need to change, including the brake pedal. But the brake pedal change is only required for model year 1997. Apparently the booster/bellows used prior to September 1999 is no longer available. You should read these TSBs because if I am reading them correctly then you can only buy they new style and have to change other parts so that the new style will work in your 1998. If this is true and it is expensive to update parts for the new style to work, then you might consider buying a used booster. I assume a used booster would come from a model year 1997-1999. Looking at your pictures and the source of the water that got into the booster I can see why Porsche changed things in September 1999. Very good job of taking it apart and taking pictures. I've had a look in RennTech.org Forums > Porsche TSB Menu > Boxster (986) TSBs but I am unable to open any of the TSB's. Yes you are doing something wrong! You have to give Loren some $$$ and become a contributing member first! Donate through paypals and you are "on the team". The donate is at the top under the renntech.org logo. It's worth it alone for the TSB but there are other perks that I forget at the moment, another poster can chime in. Which reminds me it's been a year since I last donated! Thanks Shawn! ;) Just done that now! I think I've to wait for confirmation before I can proceed! It's definitely worth it, as I've gotten some great information from this site to date! Hey Tool Pants, thanks for the advice about the 2 TSB's, Brake Booster Seal at Firewall Changed and Brake Booster / Spare Parts Requirements. I've read them both and they give really good detailed information. ;) I will look into checking the availability of a second hand booster, failing that, I'll just have to order these parts new. I just spoke to Peter. He said you can buy and use a new booster without making any changes to your car. The new booster will come with a bellows attached to it. Remove the bellows. Then install the new booster with all your original parts. So, forget all the details in the bulletins. 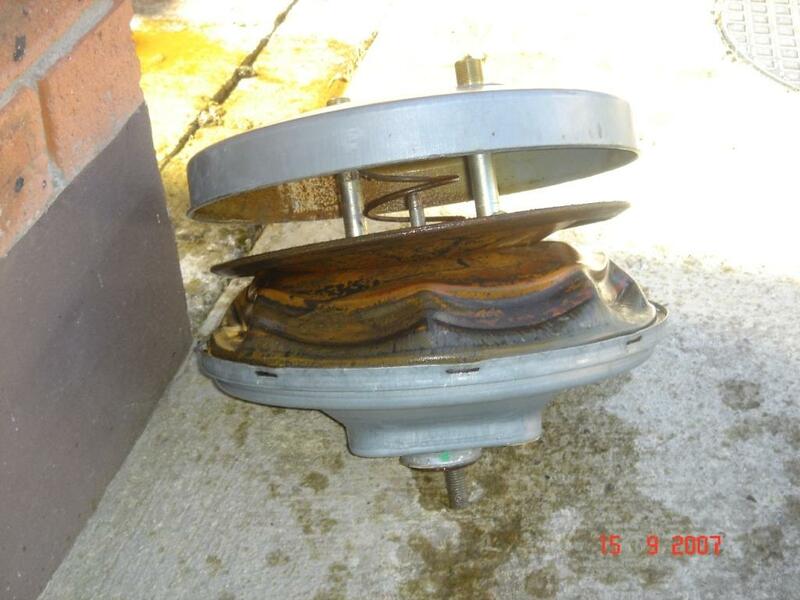 You risk the chance of water getting into the booster again, so this time make sure to keep the water drains free. Terrific, detailed write-up with excellent photos. Thanks for taking the time to share your DIY with us. Before I attach the new booster, I will prepare the area with silicone and PTFE Tape (Thread Sealing Tape). This should also help to prevent water getting in, in the future. Also, just something to note. The Porsche TSB and Bentley Maintenance book, says that you have to drain the brake fluid, and completely disconnect the brake master cylinder when removing the booster. This is only the case when working on a Left Hand Drive Boxster. 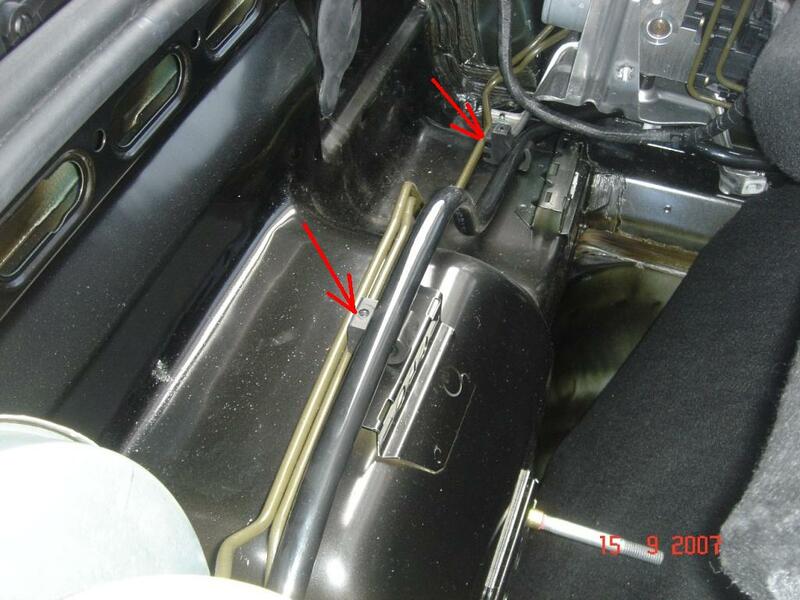 As mine is a Right Hand Drive Boxster, the master cylinder can be pulled back just enough to remove the brake booster. I check the website for a cars part chain that has a shop down the street from where I live. They have a rebuilt booster for $136 USD. It is also used by certain VW and Audi models. Now that I think about it all the boosters I have seen had a Lucas sticker on them. I can see a Lucas sticker on your booster. Pelican Parts is ok. I am on the Boxster section of their message board. There are 2 long Screw/Bolt as follows: "Pan Head Screw - M8 x 154 x 80 - 999.073.124.09". These hold the brake servo and master cylinder to the firewall. Hi CarMan356, great write up and pics which are really helping me out with my sticking brake pedal. 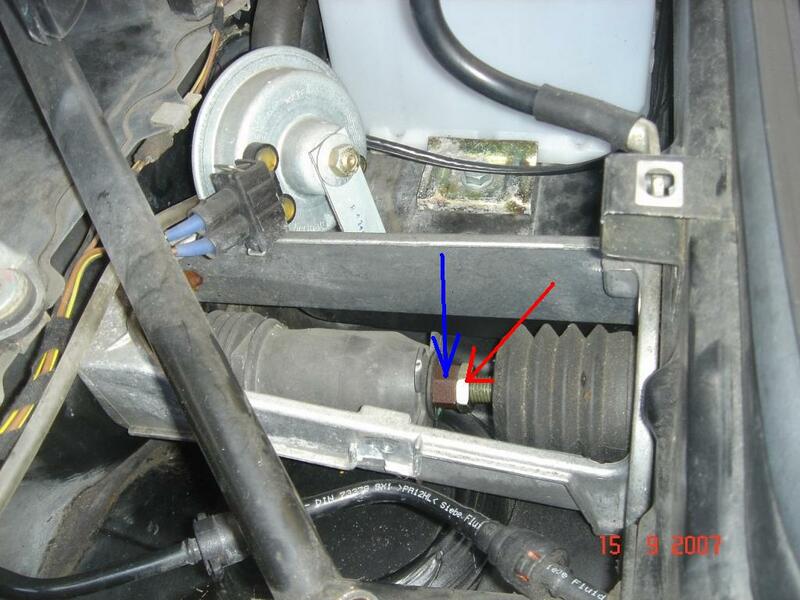 1 question though, "Loosen the lock nut (red arrow) and then loosen the connecting piece (blue arrow). Continue to loosen the connecting piece until they separate." Ive loosened the lock nut but am unsure of the next bit, how does the connecting piece come loose, do i loosen clockwise or anti clockwise? My thoughts are that the centre thread should stay fixed and the blue arrow bit turns anti clockwise (looking from the windscreen forwards) until it releases but when I do this the thread turns with Blue arrow bit, maybe this is seized on? or am I totally getting this wrong? Many thanks for a great assist.